Just about every knife collecting related book or magazine that you put your hands on these days has some mention of Mark Zalesky in it. Either as a valuable resource for information or a portion written and/or edited by this incredibly knowledgeable historian/collector. 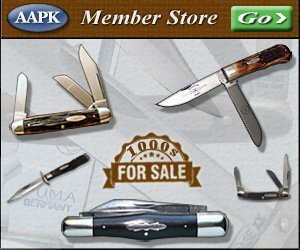 Anyone of any notoriety in the hobby of vintage knife collecting knows of Mark. The following is just a short list of publications that Mark has been involved with and the list could be much longer if he wasn’t so humble. He has been writing freelance for Knife World since 1990 and full time since 1997. He has also written pieces for the National Knife Magazine, The (Automatic Knife) Newsletter, The Antique Bowie Journal, The American Bladesmith, and several local and regional club publications, as well as the books, Knives Digest I and The Razor Anthology — probably in the ballpark of three hundred articles in total. 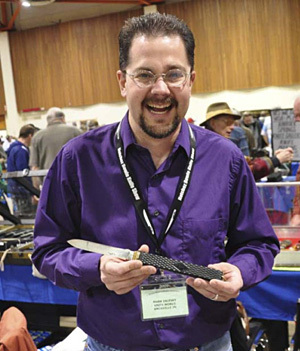 Currently he is the co-author of The Official Price Guide to Collector Knives, 15th Edition and hopes to continue with that series in the future. I am sure many of us support that notion for sure. I met Mark some years ago when I was turned onto Knife World Magazine by Bernard Levine. I had sent Bernard some pictures and questions about a Pennsylvania made pocketknife and he decided to use the material for his “Whut Izzit” column in Knife World. Of course I had to have a copy and received my complimentary issue and instantly felt I had found my home. Finally, I had people who truly understood my passion for vintage knives and where they came from in the first place. Each issue is devoured instantly as I walk from the mailbox to the front door. My wife knows to let me alone for at least an hour as carefully read each and every word and study the photos closely. I make comments to her about various aspects of the issue and she politely says “oh yes dear I can see why you think that” and really has no idea what I am saying. She is wonderful about placating my almost fanatical obsession for vintage cutlery. Mark has been very kind to me personally and helped me by publishing some of my own articles on knives in Knife World Magazine. My favorite experience with Mark involved his innate ability to guide me through learning how to take better photos of knives. My first attempts were awful now that I see them and Mark so patiently told me how to fix them. I would take a few pictures and then email them to Mark. Always starting out with a positive statement like “looking good but that dark shadow kinda takes away from it” or “gee I can not make out the tang stamp”“, try making a light box or changing the settings on your camera. Heck, he even looked up the information on my personal camera and mailed me the instruction on how to change the light settings. He must have realized that most of us are poor photographers, so this prompted him to re-release an in-depth article on how to photograph cutlery. If you like great pictures of old knives, talk to Mark. I think he could create a coffee table book of vintage knives that most of us would have a hard time putting down. Of course he was instrumental in helping me fulfill my desire to publish a book as well. “Tidioute: A Town With an Edge” was born out of Mark’s encouragement and recognition of my desire to learn more about this portion of cutlery history. I spent endless hours bugging him for info and asking for research work that he had from John Goins. It started when he published my first knife article in Knife World Magazine entitled, “Tidioute, a Small Town With a Big History”. I met Mark for the first time in person at an NKCA show that was held in Ohio at that time. Not knowing even what he looked like, I ask a fella at a table if he knew him. “Everyone knows Mark,” he said. Hunkered over a table with his camera in hand, was this guy talking to small crowd about a particular pocketknife. When I introduced myself he acted as if we had been friends for years. That’s just the way Mark is. I now consider him a good friend, mentor and a valuable resource. I sent Mark a series of questions that I felt would be of interest to all of us in the hobby. So sit back with me and let’s learn a little more about one of our own. 1. Tell us the beginnings of your interest in knives. My Grandfather, who passed away in February, was a gun nut all his life (primarily single shot rifles). My father grew up with this interest, but by the time he got out of the Navy in the late ’60s the Federal gun laws had been ramped up and the gun business was changing. So instead of trading guns, Dad got interested in knives. He started out with U.S. & British military knives, but when I was born (so I’m told) my mother refused to have her boy grow up with all those “killing knives” around! Dad switched to pocketknives for a few years, then moved to bowies and ultimately to English folding bowie knives which he still collects today. He also made quite a lot of custom knives over about a 10-year stretch. When I was young, my Dad mostly worked the graveyard shift, so I didn’t get to see him as much as I wanted to — mostly on the weekends. And some weekends, he’d get up Saturday morning and go to a “gun show” for most of the day! (Knife-only shows hadn’t been invented in Iowa, and still really haven’t.) At about age 5, I was still deemed “too young” to go, and I can remember throwing a horrible fit as he left for another show, and I was left home to bake cookies with my Mother! Finally, it came down to “You’re taking him with you!”… and that was that. I took to knife trading like a duck to water, and the rest is pretty much history. Dad, Grandpa and I went to a LOT of gun shows together over the years, and I have some very fond memories of our adventures together. The first really good knife I ever owned, I bought this Marble’s safety hunter in an antique shop on the way home from a gun show at age 9 or 10 (had to beg my Dad to stop, but it was a good payoff!) It has some spotting but has never seen a stone. This piece started me on collecting Marble’s knives, which I chased for 20 years. 2. Your focus or primary collecting interest. My main collecting focus is American made bowie and dirk knives from the Civil War and pre-Civil War era. I just put together a list of other cutlery things I collect or have collected for my iKC profile (www.iknifecollector.com), and there are so many little niches I’ve pursued that it looks like I’m all over the place. But I’ve always had a main collecting interest, with two or three “side projects” going at the same time. When you get to the point at which it’s unusual to go to a show and come home with even one item for your collection, I think it’s time to pick up a new interest — and the knife world offers a nearly endless variety of them. 3. Person or persons who most influenced you in the cutlery world. Well, my Father is the main one — basically, I grew up with a knife collecting and knife making tutor in the house. Though his interests shifted somewhat over the years, he never got rid of any of his knife books or magazines. I have always loved to read, especially about knives, and when I got out of college and had a little money I started buying every knife related book I didn’t have, and I’m still doing it today. The authors of all those great books have had a big impact on me – John Goins, Dewey Ferguson, Bernard Levine, and dozens of others. And Houston Price of course, I owe Houston absolutely everything when it comes to the publishing end of things, and he’s the best boss in the world. Proof that my ancestors knew the value of a good knife, this Crandall premium stockman belonged to a great uncle I never met. It’s seen quite a lot of use but has never needed more cleaning than a wipe with some good oil. 4. I recall you saying you left a lucrative position to work for Knife world as it “was a dream job” for you. Expound on that. That is a bit of an exaggeration, but there’s an ounce of truth in it. I was working as an Environmental Chemist fresh out of college and making what was (to me anyway) pretty darned good money, but I had inherited a pretty bad political situation and when the contract came up for renewal, I’d had enough and just walked away. Meanwhile, I had heard that Houston Price was thinking of retiring as Editor of Knife World and that my name had been mentioned (I had been writing for KW on a freelance basis for five years or so). Houston and I talked a few times, and I wrote some more freelance pieces, dealing in antique knives for a living while we both sorted out what we wanted to do. I have to admit that the economic realities were a little shocking… but only a fool would turn down the opportunity to do what one loves to do for a living. I will admit that there are difficult days too, but I honestly cannot imagine any job, anywhere, that I would rather have than this one. Not long ago, my wife Chris asked me what I would do if I won the lottery. Easy: I would hire a couple more people to handle all the daily hassles at Knife World, and keep the more enjoyable responsibilities for myself! 5. Your thoughts on where the hobby is going in the future. Knife collecting has always been in a state of flux, probably now more than ever. The internet’s relationship with knife collecting is not yet done evolving, and I don’t think that anyone knows where that will go – but it will have a huge impact on the hobby. For as long as I can remember, I’ve heard people say that the “old collectors” are dying off and that there aren’t enough young collectors coming in to replace them. I just don’t agree with that. First off, there never have been a large number of collectors with disposable income under the age of 40 or so; if anything, there are more now than ever before. 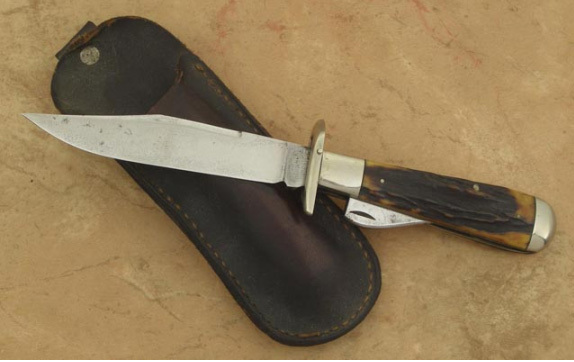 But it’s evident that most of the younger collectors are starting out in less traditional fields of knives. And let’s face it, it’s a lot easier to build a collection of current handmade or factory knives than it is to jump into the world of antiques; it requires less education and involves less initial risk. 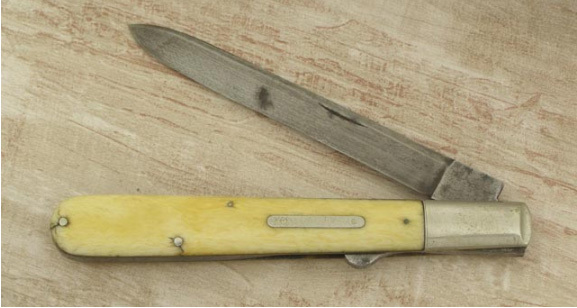 The complexities of collecting antique pocketknives, bowies, military knives, Randalls, or whatever are a byproduct of the highly evolved state we’ve reached in these fields; they’re mature, the prices are stable and the knowledge base is large. Another byproduct of this is that there are also counterfeits to be dealt with, so you really have to do your homework before diving in with your hard-earned money. The risk with collecting new items is that interest in them will wane (i.e. many of the limited edition knives of the 1970s craze). The risk of collecting long established fields is that you have to protect yourself from there are counterfeits and overpriced knives. 6. An area you feel will be “hot” in the next few years. Maybe a pattern, or brand, or just an unexplored area of interest. 7. So what is your most prized piece in your collection? Do I have to pick just one? I could choose a dozen…I’m going to say that it’s a Samuel Bell dirk knife which cost me a good bunch of money and a whole lot of knives from my collection in trade. Samuel Bell was a silversmith who made dirk knives in Knoxville, TN (1819-1852) and San Antonio, TX (1852-1882), and I’ve spent a lot of the last 12 years researching his life, work, and family (hopefully, one of these days I’ll be able to pull everything together and publish it.) It’s no longer in perfect condition, but it’s the work of a maker at the very top of his game and I’m not sure that any one knife maker today could pull this knife off start-to-finish – and I have the utmost respect for today’s craftsmen. This is the Samuel Bell dirk knife described as my most prized piece. Ivory handle, coin silver mounts, engraved and with silver pique work on the opposite side. I’m not sure whether this is a late Knoxville-made knife (1840s-1851) or an early San Antonio example (1852-1860s). I own a few knives that are “better,” but this one is near and dear to my heart. 8. Disappointments in the hobby and be specific. It took me a while to think up an answer to this question, as the rewards vs. disappointments balance of my knife collecting experience has been staggeringly one-sided. And really, this event reflects a disappointment in people rather than in collecting. Back in the mid-1980s, when I was still very much a kid at this, my Father and I were at a gun show when a collector friend came to our table showing off an extremely rare M.S.A. 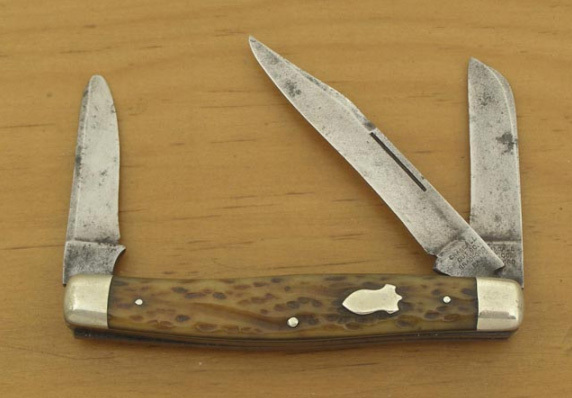 Co. (Marble’s) pocketknife, which he had just bought from a dealer in the room. At that point, I had been collecting Marble’s knives for several years, and while I had not seen one before I knew exactly what one should look like — and this wasn’t it. Everything about the knife was wrong, it was a fake, and I was 100% certain of it. The owner saw my initial reaction, asked me what was wrong, and I told him the truth. Now I can’t honestly tell you whether it was ignorance or if they were just sticking up for the fellow who sold the knife, but my friend went around the room consulting several dealers about it, and all of them backed up the seller and said that I was nuts. It was years before my friend learned the truth, and I guess that knife was part of the reason he dropped out of knife collecting. The moral of the story is that knife people are just like every other kind of people; there are good ones and bad ones, and there are mostly good ones who will let themselves slide when put in a bad position or if tempted by the almighty dollar. In any case, it was a good life lesson for me, and I have not forgotten it. A favorite quote of mine comes from an old book on art fakery, in which an experienced dealer stated, “I trust to my own eyes, I view each piece with the recollected vision of forty years’ experience [in the art field. ]” If you are going to collect anything expensive, my advice is to take the time to educate yourself so that you can “trust your own eyes,” and not be forced to rely on anyone else. If you can’t do this, how will you know when the person you’re relying on is wrong? 9. If you could have just one more knife what would it be? Over the years, I have been lucky enough to land a lot of the knives I never thought I would get to own, so I’m going to go out on the crazy limb and say a Daniel Searles bowie, like the one on display at the Alamo… there aren’t more than 5 or 6 known and I think that only one is in collector hands. Winning the lottery is not enough to get you one of these; you basically have to be born into the right family! A side-collection I’ve pursued for years consists of American-made folders with exotic pearl handles, and over time I’ve mostly narrowed it down to those with “smoked” (dyed) handles. Here are a few favorites; left to right: Keen Kutter, Cattaraugus, Remington, W.R. Case (pre-1920), and Robeson. All but the Remington are handled in what Cattaraugus called “oriental pearl”, which is the outer portion of an abalone shell, dyed. The Remington is dyed oyster shell. 10. Tell us about Knife World Magazine. KNIFE WORLD is different from the other knife publications — and if you don’t believe that, just ask any subscriber. We’ve been around since 1977, always a monthly, and always on newsprint. We’ve improved the paper quality and printing over the years, and added some full color pages a few years ago, but the basic concept is still the same. Each issue contains articles on a variety of subjects from antique knives to handmade knives, factory knives, military knives, knife history, use, testing, book reviews, etc. etc. Along with all that, there’s Bernard Levine’s “Whut Izzit” question-and-answer column, Knife News, Knife Club listings, Classified ads, the most comprehensive Knife Show calendar anywhere, and a couple of other features. In closing, I want to thank Mark for taking the time to answer my questions. It only took about six months to convince him to do it. I kind of liked being on the other side of the desk in this instance and Mark being who he is, took it all is stride. Thank you Mark, and please keep up the great work that you are doing for all of us collectors out there. You will not find a knife person more generous and knowledgeable then Mark Zalesky.